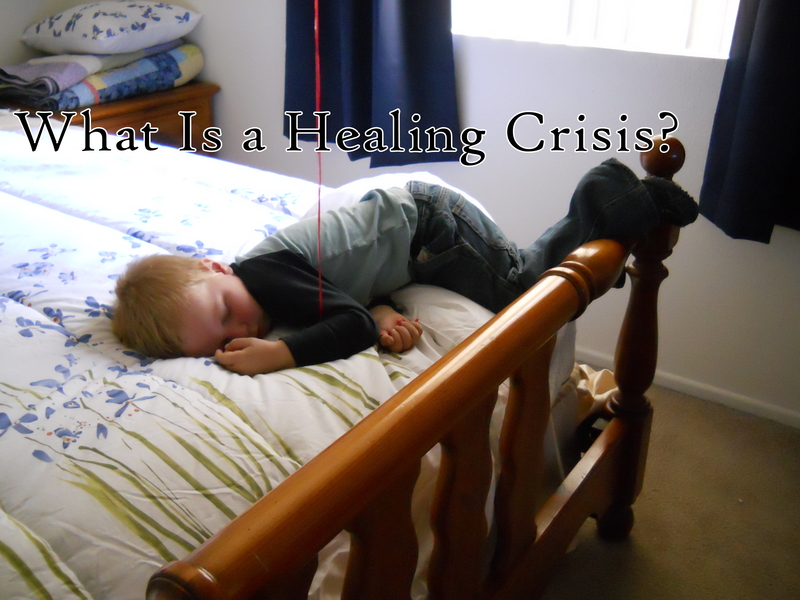 Home » GAPS Diet » What is a Healing Crisis? A healing crisis is the body’s sign of being overloaded and overwhelmed with the changes that are taking place on the road to becoming healthier. This is often due to the body suddenly recognizing and eliminating toxins that otherwise had just been sitting there. Donna Gates in The Body Ecology Diet refers to healing crises as something that the body does as it’s organizing a major cleanse. 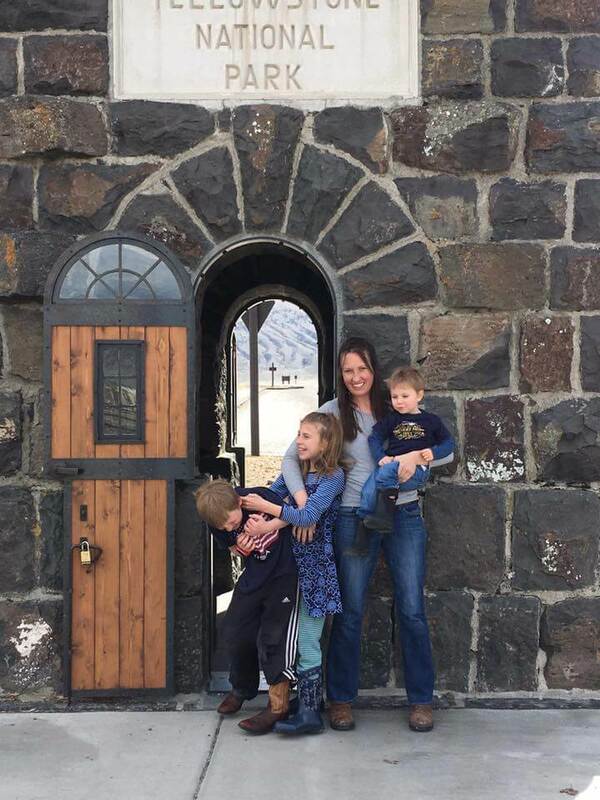 The first time I saw a healing crisis was when I put my daughter on a gluten free casein free diet (prior to GAPS); one of her cheeks turned bright red with the removal of gluten, which was acting like a toxin (or feeding toxins) in her body. As we went through the GAPS Intro I saw the same red cheeks. When I started her on B12 (B12 plays a huge roll in detoxification, which many GAPS kids have trouble with) she got night terrors/has trouble sleeping. Night terrors and trouble sleeping are other signs of her healing crises, though these also are signs that she’s gotten food she shouldn’t have or has been exposed to a toxin. This is where it gets tricky figuring out what is what. What’s the Difference between a Healing Crisis and a Reaction? This is the hardest thing to figure out when first trying a new diet, supplement, or treatment. The way I go about figuring this out is first I look at what has been introduced- is it known for causing detoxification? If so, it’s likely a healing crisis. A reaction is usually caused by one of the more allergic foods, foods that are difficult to digest that are being introduced too quickly, and/or synthetic products. The third reaction/crisis that we’ve dealt with is the so-called Atkins flu that happens when switching over to a low carb diet. The first two times I put my little one on intro, she got lethargic, dry mouth, didn’t want to eat, and acted like she had the flu. This isn’t really either a healing crisis (though that is part of it) or a reaction the way someone would react to a food they’re allergic to- it’s just the body learning to run on fat rather than carbs. What are possible healing crisis symptoms? The symptoms of a healing crisis are all over the map. Red cheeks, headaches, joint aches, flares of asthma, irritability, spaciness, tiredness, and digestive upset are all possible symptoms of a healing crisis, but there are many many more. You really need to pay attention to your body’s symptoms (of course consulting your healthcare professional when needed!) so you can learn to recognize a healing crisis from being sick from having a reaction. In the 30 Days on the GAPS Intro e-book I give you a chart at the end that can help you track these symptoms and find patterns. Should we try to slow down a healing crisis? I do try to slow down healing crises. They show that the body is not processing toxins as quickly as they are being released. Epsom salt baths, extra rest, drinking plenty of fluids, eating healthy foods as your body craves them, clay, and detoxification tea can all help. When needed I also cut the dose of whatever is causing the issue down by quite a bit (in the case of B12 we went from every 3 days to once a week for a while, then back down to every 2-3 as tolerated) and see if that helps. Commercial probiotics, epsom salts, coconut, and kefir and/or yogurt can all require very slow introduction to keep from overloading the body. When starting a major diet change, you may want to slowly transition over the course of a couple weeks rather than go cold turkey. Now that I’ve scared you away from trying anything natural to improve your health, I should mention that seeing a healing crisis is actually a very helpful sign! I was telling my neighbor who was trying her toddler on the GAPS Intro Diet, “Since he’s reacting to it, you KNOW there’s something wonky in his symptom, and it’s being fixed with food! If nothing happened, you wouldn’t know whether this was doing anything or not”. Healing crises are important to know about, because they often get mistaken for allergic reactions. Thinking that many foods are causing allergic reactions can unnecessarily limit your food choices. It also is helpful to me now as I’m trying new therapies out on my little one. She had a healing crisis (night terrors) to KST. I honestly was pretty skeptical that KST would help her, and without seeing her go through a healing crisis after just one treatment, I likely would not have spent the money to get her months’ worth of treatment, and the continued treatment has helped her tons. A healing crisis is great for showing you where you can focus your time and energy on, because it shows what the body is responding to. A certain form of niacin can cause flushing that can make a person feel like s/he is having an allergic reaction. This is important to know for people who are taking niacin specifically or a B-complex that includes niacin. It’s not uncommon for people to believe that something very serious is happening because they haven’t been warned about “niacin flush.” Switching to a different form of niacin will eliminate this reaction. I just mention it because you noted that B-12 can cause a healing crisis. If someone is taking a B-complex they might experience niacin flush but mistake it for something else. My mom had a horrible reaction to niacin, to the point of being dangerous. I believe her dose was far too high for a first-time script. It’s definitely something to learn about prior to introducing it, and keep the doses very low at first, increasing slowly, and only if necessary. I’m glad you brought up the subject, Chandelle. I ate at a vegan restaurant last year and EVERYTHING I ordered had soy in it or was made out of soy. My face got burning, itchy, hot, it felt like my face was ON FIRE. I went outside to get relief as panic was setting in. My face was bright red and my arms and chest were itchy and hot and slightly red. It lasted for about an hour, then slowly started to fade. Could that have been niacin flush? No, no, no, that was NOT niacin flush. Niacin flush ONLY happens from taking niacin. I take 500 mg/night and usually get a flush from it, That kind of flush is not dangerous and, in fact, is supposed to be more effective. You may have had an allergic reaction to the soy; not all flushes are “niacin flushes”. ER if I haven’t been talking to her to let her know that’s what happens with niacin. She now thinks it was funny too. My son has been on a mostly GF/DF diet for the better part of six months (we do have the occassional goof, especially when traveling or when he is at my mom’s — surprise, surprise!). He has had faint reddish bumps on his thighs, the triceps, and his cheeks since he was about two. Recently, those faint reddish bumps have turned into a bright scarlet color and it is giving me some distress. I did just start back on B12 tabs. He takes a probiotic (HMF Neuro). I also started him on l-glutamine yesterday. We have been doing weekly NAET, but we have stopped for a few weeks just to give us a bit of a break. I think both B12 and L-glutamine work to detox, I would guess it’s a healing crisis. I usually only try one big thing (like NAET, b12 injections, major diet change, etc) every 3 months, and will change one supplement a month. I like to keep it simple (though naturopaths will often advise doing a ton at once) so I can see what’s working and what’s not. Hi AnneMarie, Im sorry as this comment is a little late and I’m sure your son is sorted by now, I just wanted to share my story. I’m 38 yrs old and keep fit and eat as healthy as I can, however I wanted to loose the bloat in my lower abdomen because deep down I have known for some time it isn’t normal as I’m slim everywhere else and as I do massage for a living couldn’t understand how it always felt heavy and achy to massage. Decided to eliminate all wheat products one week ago and yesterday bright red bumps appeared firstly on cheeks and I thought acne rosacea but then they have got worse and spread to upper arms and thighs now traveling down legs and on lower back kidney area, as its Saturday today and doctors are closed I popped into my local Holland and Barrett then Superdrug, well everyone seems clueless and says you must be allergic to something but the only thing that has really changed is not having wheat and gluten! I have read about healing crisis in a fasting book by Paul C Bragg, im certain it is but everyone thinks im nuts. Sorry to go on and I do hope your son has got back to normal and i’m sure healthier than most as you seem to be doing all you can by cutting out the nasty stuff. there doesnt seem to be enough info on healing crisis so thanks Cara for startin this discussion. Thanks for this info, Cara! @Amanda: It sounds like you got MSG poisoning. I had the exact symptoms after eating at a Chinese food place. I don’t see why a vegan restaurant would be using MSG though. I read that soy has a lot of Estrogen in it. Maybe it was the Estrogen in the soy? Keep you chin up; it’s a long road. I’ve been through a lot with my son and it took several years to figure out what was going on with him and fix it, and then it was on to the next thing, lol. But now he seems basically healthy (at 15) — long may it last! He’s enjoying eating like a regular teenager, which is not good, but hopefully my teachings will set in at some point. Massage can also cause a Healing Crisis. More so with Hot Stone and Essential Oil treatments. My aftercare instructions include increased fluids with fresh squeezed lemon in water, epsom salt, sea salt and baking soda baths. I get this question a lot on my blog and really appreciate the information you have pulled together here. I will be sharing this post far and wide. Thank you for addressing this topic and clearning the air a bit. Great post! It’s good to remind people that sometimes what seems like an averse reaction can actually be a really positive sign. I’m about 3 months in to GAPS and seem to be experiencing a second round of severe healing crisis. I think I moved through intro too quickly (about 5 weeks), so perhaps it’s a combination of die-off and food reactions! I’ve gone back to the basics to try and figure it out. It’s so tricky to figure out what is a healing crisis and what is a reaction like you said, but it’s not impossible. I think we get distracted from our bodies by media, busyness, tiredness, and just general not paying attention. All the tips and tricks in this post and the GAPS e-book are really helpful, especially the urge to raise bodily awareness. I have noticed causes and effects that I would have missed if I wasn’t looking for them. Great post! My daughter gets hives after an epsom salt bath if she’s eaten a lot of junk food/sugar. I have a question that I can’t seem to find an answer to, Cara – I wonder what you think. I put my daughter on GAPS at 10 months old because she had terrible eczema and was losing weight. Around 22 months, she had gained plenty of weight and her severe eczema/food intolerances were gone! The last food I introduced was raw milk products. Previously, she would throw them up or get hives, but she ate them just fine with no reaction. A few weeks ago, I gave her a kefir smoothie and she rubbed it all over her belly and there were hives where she had rubbed it. I was really surprised, but stopped giving her milk products. Now I am confused – does she still have a milk allergy and needs to go on GAPS again, or could the skin contact reaction be something else? No one on the GAPS forum had any ideas, so I plan to get her tested, but I wondered if you had any opinion on the matter. Thanks! Andrea, I’m not a healthcare professional, but I’d guess both of those are healing crises- both epsom salts and the probiotics in kefir are known for causing detox. My daughter got hives from dairy as a baby and didn’t have dairy for years then in fourth grade decided to drink milk with the school lunch. No hives but she developed asthma symptoms. Personally I would just go without the dairy, I’m not convinced people outgrow allergies and I think we set ourselves up for dangerous results trying to force certain foods on kids. Good luck. I know this post is old, but I am putting my 10 month old son on GAPS because of severe eczema and food allergies. Can I possibly email you and get some of your input? I feel lost with so little info for infants but he had been hospitalized before for his eczema and want him to have a chance at a healthy gut. My daughter (7) has been following the Specific Carbohydrate Diet for two years. She was doing great – inflammation levels were coming down. She started on low dose naltrexone after a year on the SCD. A few months later, she stopped all her other medications (methotrexate, humira, etc). She has had clear check-ups – no outward signs of active arthritis or ulcerative colitis, but her inflammatory markers remain high – SED rate, EOS level and calprotectin. I took her to a naturopath in December to try to figure out why no symptoms, but continued elevated inflammation. He put her on some supplements, but they were not SCD-legal and unfortunately the uveitis returned in her left eye We took her off the supplements, and the uveitis disappeared. I would love to see a healing crisis or a reaction so I would be able to know what to do next. If there continues to be inflammation but no visible symptoms, I think she’s reacting to something. She seems to be healing, but I don’t know that elevated inflammatory markers with no visible symptoms would indicate a ‘healing crisis.’ Trying to pinpoint the cause is difficult with no visible symptoms! Another thing that I think can causes a healing crisis is suddenly taking lots of minerals. I was taking Concentrace brand Cal-Mag, which of course has minerals in it along with the vitamins. I didn’t have any issues, until I added in Concentrace Ionic Magnesium (I suffer from anxiety, and have noticed that when I take magnesium it’s much better). But two days of both Concentrace supplements and I felt like I had the flu! My joints ached, my muscles ached, my lymph nodes were throbbing all over my body, and I just wanted to sleep. I did some reading and found that when you body goes into detox mode, the most important thing is to keep all the lines of elimination open. So, I started drinking pear juice since I started having constipation and made sure to drink plenty of water. I stopped taking the supplements for a few days, and when I added back in just a few drops, the symptoms returned. So, I’m going to let my body heal completely from it before I try it again. Have you ever heard of a UTI being related to a healing crisis? I’ve been doing so well recently with a reduction of symptoms. My doctor started me on liposomal glutathione and I felt GREAT and then yuck, UTI. It’s a bit discouraging, but the dr seemed to think it was a good sign. Have you any thoughts on this or ever heard of this? It’s quite possible, I think anything could be. I’d just watch the duration/frequency, if it’s intense and then lets up, the body is handling toxins. If it keeps going on or they come back frequently without something that should cause a healing crisis, there might be something else going on. Thanks for these comments about UTI’s – I have also been wondering about this. I know this is late but it still might help someone. A couple of years ago I went on a 30 day cleanse for parasites by Renew Life. I think it was called Paragone. Anyway, I had a history of UTI’s and would be on antibiotics from time to time for them. So about 10 days into this cleanse I started getting the symptoms for a Bladder infection and it got a little intense. I phoned the company, and they encouraged me to stick with it. They said the parasites were going to the greatest areas of weakness. So I stuck with it and got over it. The symptoms cleared up and lo and behold, I have never had an infection in all this time. I think it has been about 5 years. So detox can be pretty powerful, and how we handle it. I was wondering I have a 3 year old daughter with autism. we went on the gfcfsf diet and well I can tell she is sensitive still to certain foods . Right now I have her on the SCD diet and not the correst way I’m just giving her the legal foods, It has helped and shes trying to talk but she struggles . I’ve been thinking about the GAPS diet do you suppose that It’s a better route to go than SCD? what do you think? I have been reading all the comments and looking for some solutions too. My son 6 was on GF/CF ,worked very well with him.Then i put him on GAPS .IT did something good to him that his hyperactivity stopped.He went into ketosis too.But was fine with it after a while.But now he has either reflux or gastritis.I am not able to figure out what.I am trying a lot like ACV,Kraut juice etc.But nothing seems to work much.He was urinating in excess too whic stopped what i stopped his enzymes. I put him on only vegetable diet.THings did get better but did not go (acid reflux).I again put him on Broth and meat.The symptoms are still the same.I really don’t know wherw i am going wrong.Is it allergy or is he healing and these are just the dieoff reactions. And also i have been noticing ACD cause excess urination.Is it true. If anyone has an answer pls comment. Sometimes i feel GAPS is not working for him. I am not able to move to the next stage.He snatches food whereever he find.In school /at home. My son 6 was on GF/CF ,worked very well with him.Then i put him on GAPS .IT did something good to him that his hyperactivity stopped.He went into ketosis too.But was fine with it after a while.But now he has either reflux or gastritis.I am not able to figure out what.I am trying a lot like ACV,Kraut juice etc.But nothing seems to work much.He was urinating in excess too which stopped when i stopped his enzymes. I put him on only vegetable diet.THings did get better but did not go (acid reflux).I again put him on Broth and meat.The symptoms are still the same.I really don’t know where am i going wrong.Is it allergy or is he healing OR these are just the dieoff reactions. And also i have been noticing ACV cause excess urination.Is it true? I am not able to move to the next stage.He snatches food where ever he finds food .In school /at home. Im so glad to see these posts! I think this is what I have been experiencing. I have been doing different detoxs for the past 4 weeks and this past week ran into MAJOR issues. My first detox was a Dandelion root tea I drank for 4 days. It caused me to have diarrhea. Several days later I did an epson salt bath that included ginger root. I felt dizzy while in it but felt good the next day. Then I started these body wraps that remove the toxins from your fat cells to make you lose inches. I did those twice in a week and a half period.. Then the 4th day I felt I was going to pass out. I ended up in the emergency room the next day with a horrible headache, dizziness, confusion, lethargy, shaking, diahrrea, and nausea. My blood pressure was EXTREMELY high (not normal for me) so they put me on IV fluids thinking I was dehydrated. It defintiely helped but a week later I am still not feeling myself. THe headaches are gone, I am sleeping through the night again, and the diarrea has stopped. But I still have some dizziness, dry mouth, acidic stomach, and my bowels are inflamed causing some discomfort and gas. Im a week and a half into no cleansing and just recouping but wondering how long all this can last. Im starting to get a little nervous something else is going on. I went to my DR after the ER and she said ride it out….Come back in a week if Im not feeling better. Can it take longer than a week to fully recover? I’m very interested in the idea of ‘healing crises’. My son just started on GAPS a little over two weeks ago & we have been overwhelmed at his progress (& then regression). His main issue is eczema, which amazingly, cleared up the first week on GAPS. Then I added some almond butter into his diet & his eczema flared. Now he is back to how he behaved the first week or so, having diarrhea every day, sleeping long hours during the day & not very well at night. Would you say things like diarrhea are part of the die off process of GAPS? It seems like he began with it, then it went away. Now it’s back again. It has me very confused & not exactly sure what to do next with him. I’d like to move him past bone broth soups, stewed meats & veg, ghee, kefir, avocados & egg yolks but from what I understand, he shouldn’t move until his diarrhea is cleared up, correct? I’ve recently learned about the healing effects of coconut oil and have increased my usage considerably. Over the last couple of weeks, all my teeth have become sore and achy. Not any particular tooth, but all of them. I am scheduled for a revision of my artificial knee in less than 6 weeks and want to know if a healing crisis can cause infection in any part of the body. Bacteria naturally migrates to an artificial joint and infections can be devastating. I really need some information about this and do not have a doctor who understands this. Thanks so much for your post! It got me thinking. I had been on GAPS intro for three weeks and was feeling great. I had just moved on to stage 4 and kind of rushed things by having some fried steak for dinner with some broth and veggies. That night I also did a castor oil pack over my liver (and fell asleep with it on instead of taking it off after half an hour). The next morning I woke up with acute stomach pains, trapped gas and a feeling of disorientation. That whole day the pain was just about unbearable. It was sharp, stabbing pain under my rib cage, my liver felt like it was on fire, and anytime I moved the pain shot up my spine to my neck. I was very pale and felt weak. A simple trip down stairs had me out of breath, my heart was racing and my blood pressure was high (not normal for me at all!) I ate nothing but broth for the next four days but even that caused cramping. The acute pain faded after the first 24 hrs. but the trapped gas and discomfort in my abdomen persisted for a solid week. I just thought initially that it was a reaction to the overcooked fried meat that my body wasn’t ready for, but now I’m wondering if a healing crisis could manifest in that way. A week later I’m finally back on track with GAPS (I pretty much just started over on intro to give my gut a break, but moved through it pretty fast), and am mostly feeling ok, with the occasional twinge. Any thoughts? I recently made some radical changes in my diet. I stopped all alchol consumption, cut way back on my smoking to almost quit. Started juicing vegy’s, eating fruit smoothies, and taking shots of wheat grass daily. Also getting B-complex and B-12 injections every other week. These changes triggered a Health Crisses. This Crisses scared the Hell out of me! My lips swelled up and got hard, I itched all over, I had diarrea and vomitting and broke out in intense sweats. I was disorientated and very weak. OK my question is can this happen again? If so how often? I thought I was going to die! Had know idea what a health Crisses was. Can they be dangerous? At least next time I’ll know whats going on. Would appreciate any feed back. I’m a rookie at this new life style. is what he manifested in his experience. You list “Epson Salt Bath” as one of the things that caused ‘healing crisis’ but suggests it to slow down the healing crisis. I’m confused. Also, is this similar to ‘die-off’? Thx. It is confusing :) Deficiency in sulfur and magnesium (both found in epsom salt) slow’s the body’s detoxification system, but sometimes when people add them in they detox the backup faster than they were expecting. Are these books on Amazon? We have a profoundly affected non communicative combative 31 year old Male with autism but he arrived at this after a Vaccination he had a high fever the night after the shots and almost died but it was enough to cook his brain…Any way after all that..came the diagnosis of Autism. His name is Carlos. The docs just prescribe one thing after the other the boys mother is willing to try anything. She is my cousin from Mexico so she does not read or write in english so I do everything I can to help her. they are mostly vegetarian except for a little beef on holidays but mostly beans rice seasonal veggies from her garden supplemented by organic stuff unlike myself. If you can recommend books to buy I never received any of this information from any of the Docs at Loma Linda I am trying to just get him to be a little calmer when he gets changed or getting him up in the morning he wants to stay up all night till 130 230 in the A.M. my cousin is getting to her wits end. We dont want to try him on any more meds as they dont appear to do anything except agitate him even more The only direct medication for the stomach is granulated Omeprazole 40 MG per day and lo acid meals but it does not stop him from putting his hands in his mouth or feigning vomiting. Any way I have probably gone farther than I want to but if it helps to descibe what he is doing well I would rather give too much info than not enough. Thanks in Advance please let us know the books/videos to follow I am binge watching your other postings on You Tube when I get the time but I would rather have something written so I can translate it from the book and pause when I like. Hi Jeff, yes, they are on Amazon. And I believe the GAPS book has been translated to Spanish if that helps. Sounds like you’re on the right track, I admire how you are helping him!